Budapest-based IVANKA recently unveiled the RainHouse - a revolutionary building that collects rain and filters it through a special bio-concrete system to turn it into the highest quality drinking water. 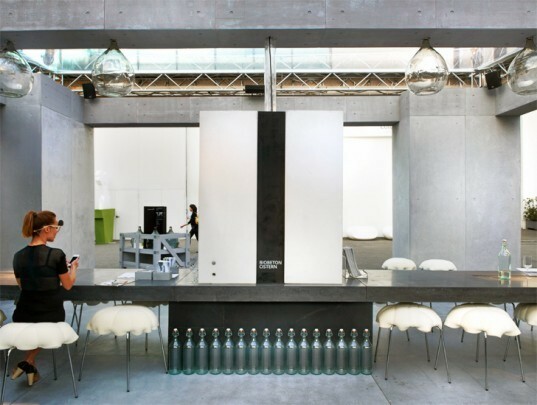 A demonstration of the firm's Water of Life project, the RainHouse is essentially a massive filtration system that allows residents to enjoy free, sun-distilled drinking water without lifting a finger. There were a lot of creative, efficient designs featured at Milan Design Week, but this one just might be our favorite. The RainHouse’s complex rainwater harvesting system is built around IVANKA’s unique bio-concrete, which is PH neutral and bio-compatible with water. With freshwater resources dwindling all over the world, the ability to construct homes that conserve and produce drinking water would be priceless. To demonstrate the concept, IVANKA built a 1:1 scale demonstration model outside at the Superstudio Più gardens during Milan Design Week. “Rain” fell from a fake cloud hanging over the model so attendees could watch as the water flowed effortlessly from rooftop concrete tiles into a bio-concrete-lined storage tank. The RainHouse has undergone 6 months of successful testing at Hungary’s Balaton Uplands National Park where geographic parameters are the most suitable. Lake Balaton is the largest freshwater surface in Europe, so the air is especially pure and rainfalls are favorably frequent in that region. Way to go! Congratulations! Now just add a RainSafe machine and this harvested water can become treated potable water that is cleaner than bottled water! With freshwater resources dwindling all over the world, the ability to construct homes that conserve and produce drinking water would be priceless. The RainHouse's complex rainwater harvesting system is built around IVANKA's unique bio-concrete, which is PH neutral and bio-compatible with water. To demonstrate the concept, IVANKA built a 1:1 scale demonstration model outside at the Superstudio Più gardens during Milan Design Week. 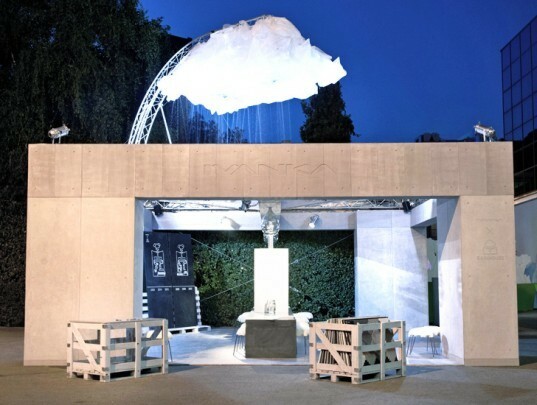 "Rain" fell from a fake cloud hanging over the model so attendees could watch as the water flowed effortlessly from rooftop concrete tiles into a bio-concrete-lined storage tank. "Rain is the initial, the most important and purest, renewable source of the freshwater cycle – a much better choice than any other source such as lakes, rivers or mineral waters from underground," explain principal designers Katalin and Andras Ivanka. "The technology we are working on represents a high ethical value as it turns rain into the highest quality drinking water in a pure and natural way of processing. It will provide access to affordable clean water for small and big scale users, from families to big companies, leaving the smallest possible ecological footprint in the process." The RainHouse has undergone 6 months of successful testing at Hungary's Balaton Uplands National Park where geographic parameters are the most suitable. Lake Balaton is the largest freshwater surface in Europe, so the air is especially pure and rainfalls are favorably frequent in that region.